The 2nd Annual Installation Ceremony of Mark Lodge Gomantak No.153 was held on Saturday, 11th June, 2016 at Jai Kieran Hall, Ramnathi, Goa. Bro. Devidas Borkar was ceremoniously placed in the Master's Chair by V. W. Bro. Madhukar C. Thakkar, the Ruling Master of the Lodge. W. Bro. Devidas Borkar then appointed and invested his Officers for the year 2016-17. The ceremony was attended by brethren of the Lodge in large numbers. W. Bro. P. C. Dhananjeya, Assistant Regional Grand Mark Master graced the occasion as representative of the R.W. 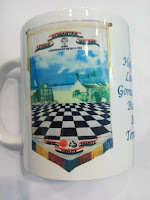 the Regional Grand Mark Master of the Regional Grand Mark Lodge of Southern India, R. W. Bro. Arvind Prasad Chitra. W. Bro. Dhananjeya congratulated the outgoing Master on his achievements in the year 2015-16.He wished the incoming Master well, and appreciated the plans he had for his year as Master of the Lodge. He complimented the officers of the Lodge, particularly the Secretary V. W. Bro Yashkaran Singh Lauly and the Treasurer Bro. Subhash Malkarnekar , for their outstanding performance. He also delivered the Address to the Master. V. W. Bro. Madhukar C. Thakkar gave a succinct report of his Stewardship of the Lodge highlighting the various activities of the Lodge. He recollected the Consecration and Installation ceremony held in June 2015, a memorable event which saw the august presence of M.W. the Grand Mark Master, R. W. the Grand Master elect, all Regional Grand Masters and a large number of Mark Master Masons. He appreciated the co-operation he received from the brethren of the Lodge. He thanked the officers of the Grand Lodge of India and the Regional Grand Lodge of Southern India, and especially R. W. the Regional Grand Master R. W. Bro. Arvind Prasad Chitra for their, advice, support and encouragement. W. Bro. Devidas Borkar, in his acceptance address, complimented the outgoing Master and officers for their excellent performance and solicited their support and co-operation during his Mastership. He also outlined his intention of placing the Lodge on a sound footing by advancing more members and improving the performance of rituals. Brethren from Hubli, Dharwad and Bangalore graced the ceremony with their presence. The evening ended with a festive board and fellowship which were enjoyed by all.